The real-life story of the B-17 "YVONNE"
Dedicated to the 51-mission B-17 Commander, Robert Orton, and his gallant crew of the famed Flying Fortress "YVONNE" Airmail is ecstatic to announce that after nearly two years of painstaking research and development we can now unveil one of the most historically critical original fine art works Airmail's Joe Jones has produced to date. 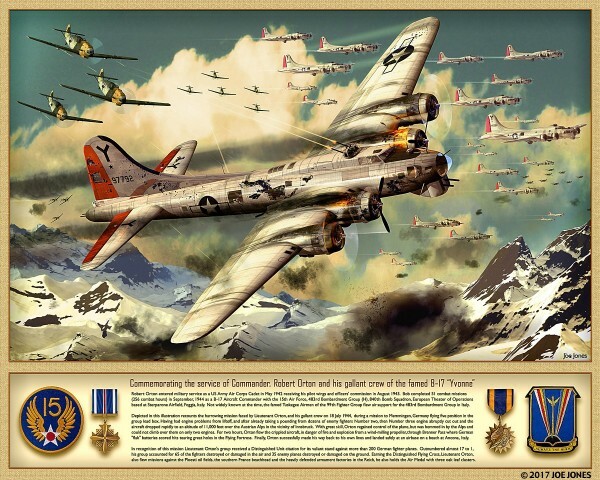 Commemorating the service of Commander, Robert Orton and his gallant crew of the famed B-17 "Yvonne"Robert Orton entered military service as a US Army Air Corps Cadet in May 1942 receiving his pilot wings and officers' commission in August 1943. Bob completed 51 combat missions (256 combat hours) in September, 1944 as a B-17 Aircraft Commander with the 15th Air Force, 483rd Bombardment Group (H), 840th Bomb Squadron, European Theater of Operations based at Sterparone Airfield, Foggia, Italy. Not widely known at the time, the famed Tuskegee Airmen of the 99th Fighter Group flew air support for the 483rd Bombardment Group in Italy. Depicted in this illustration recounts the harrowing mission faced by Lieutenant Orton, and his gallant crew on 18 July 1944, during a mission to Memmingen, Germany flying five position in the group lead box. Having had engine problems from liftoff, and after already taking a pounding from dozens of enemy fighters Number two, then Number three engine abruptly cut out and the aircraft dropped rapidly to an altitude of 11,000 feet over the Austrian Alps in the vicinity of Innsbruck. With great skill, Orton regained control of the plane, but was hemmed in by the Alps and could not climb over them on only two engines. For two hours, Orton flew the crippled aircraft, in danger of fire and explosion from a wind-milling propeller, through Brenner Pass where German "flak" batteries scored hits tearing great holes in the Flying Fortress. Finally, Orton successfully made his way back to his own lines and landed safely at an airbase on a beach at Ancona., Italy. In recognition of this mission Lieutenant Orton's group received a Distinguished Unit citation for its valiant stand against more than 200 German fighter planes. Outnumbered almost 17 to 1, his group accounted for 65 of the fighters destroyed or damaged in the air and 35 enemy planes destroyed or damaged on the ground. Earning the Distinguished Flying Cross, Lieutenant Orton, also flew missions against the Ploesti oil fields, the southern France beachhead and the heavily defended armament factories in the Reich, he also holds the Air Medal with three oak leaf clusters. Airmail now offers our beautiful 20" X 16" fine art prints paying honor to nearly 300 airmen who served not so long ago.